Melody is a woman bound by obligation. She loves her family, but can't help dreaming of more. Exploring faraway lands, thrilling adventures, maybe even kissing strangers? Anything sounds better than caring for her sickly aunt and quiet, boring, small-town life. With quick wit, an easy smile, and that devilish twinkle in his eye, Konrad has always been able to charm his way out of every bad situation, and into every lady's affections. His life is footloose, fancy free, and criminally funded -- everything he wants it to be. He's never slowed down long enough to consider any other possibilities. 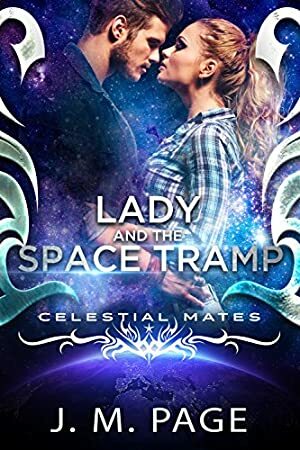 When a bizarre-looking alien from Celestial Mates knocks on Melody's door, telling her that he's found her perfect match, she thinks she may have stayed out in the sun too long. But after the cherub whisks her into a world of aliens, a tyrannical queen, and fearless rebels -- not to mention the oh-so-charming thief who threatens to steal her heart -- she's just not sure she's cut out for the life of grand adventures she's dreamed about. If any woman had ever mentioned marriage or kids to him, Konrad would have been gone before she finished her sentence. But the longer he's in Melody's company -- with her sharp wit and steel determination -- the more his dreams are featuring picket fences and puppies. But Konrad can't hide from his past forever and they're both in grave danger as the evil Queen closes in. Will Melody give up her desires to go home, to live with him on the run? Will Konrad risk everything to settle down with the one woman who's made him want to? Lady and the Space Tramp is over 40,000 words of sweet, clean romance, with NO graphic violence or explicit sexual content, suitable for adult and YA audiences. For a limited time, you get two stories for the price of one! This book includes Cinderstellar a full-length romance, so Lady and the Space Tramp ends at about 50% of the file. Enjoy! Log In to track J. M. Page on eReaderIQ. to be notified each time the price drops on any book by J. M. Page. to stop tracking J. M. Page. We started tracking this book on February 18, 2017. The price of this book has changed 9 times in the past 790 days. The current price of this book is $2.99 last checked 2 hours ago. The highest price to date was $2.99 last reached on January 17, 2019. This book has been $2.99 5 times since we started tracking it. We last verified the price of this book about 2 hours ago. At that time, the price was $2.99. This price is subject to change. The price displayed on the Amazon.com website at the time of purchase is the price you will pay for this book. Please confirm the price before making any purchases.